Mimaki India Pvt. Ltd. works to take end to end responsibility for all its merchandising processes and consciously recycles all e-waste safely through proper initiatives. Mimaki continually enhance to comply with all aspects of environmental conservation. Mimaki works through associated partners for the handling and management of electronic and electrical waste. Mimaki educates their customers and encourage them to share the responsibility in reducing the environmental impact of the products. 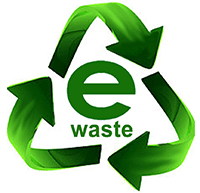 Electronic waste, or e-waste, is a term for electronic products that have become unwanted, non-working or obsolete, and have reached the end of their useful life. As the technology is upgrading at such a high rate, many electronic devices become “trash” after a few short years of use. In fact, whole categories of old electronic items contribute to e-waste such as Pagers being replaced by Keypad Phones, and Keypad Phones being replaced by Touchscreen phones. E-waste can be created from anything electronics like, Printers, Computers, TVs, Monitors, Cell phones, USB Pen-drives, Photocopy machines, etc. Solving the e-waste problem starts with education, and habit changes as a result of knowledge. Most people are trained to recycle a newspaper, bottles, and cans. Almost anything electronic in nature can be recycled properly with effort. Some municipalities have transfer stations that accept e-waste. It is important that any e-waste processor is fully certified in safe destruction and follow certified documented procedures to safely dispose of electronic waste. Ask questions before you recycle! Some unscrupulous recyclers ship e-waste overseas where it is disposed of improperly, posing a threat to the environment and its' people. Always call our E-waste Authorized Collection Centres to Dispose products that have reached end-of life. Always drop your used electronic products, batteries or any accessories when they reach the end of their life at your nearest Authorized E-Waste Collection Centres. Yusen Logistics (India) Pvt. Ltd.
C/O Yusen Logistics India Pvt. Ltd.
E-waste collection center of Mimaki India Pvt. Ltd.